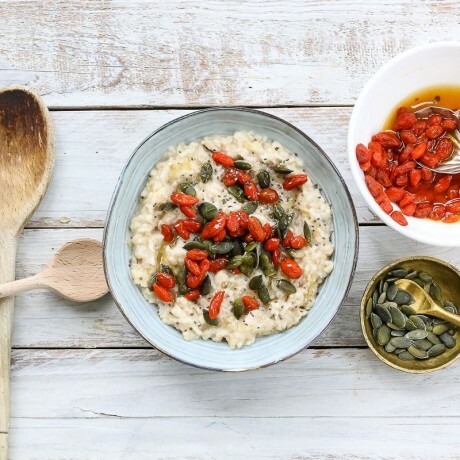 This instant porridge is a healthy, balanced meal and a beautiful start to any day. Not only ridiculously nutritious but tastes amazing too! Made with only natural, ethically sourced ingredients such as goji berry and pumpkin seeds lovingly mixed with the best British wholegrain oats. 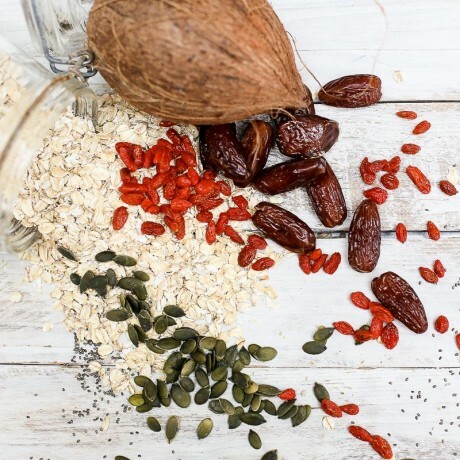 Ready in 60 seconds (just add water) this is the perfect breakfast for those on the go. Available to buy as 2 x 400g packs. Made by hand in small batches by the sea in beautiful Sussex. Store in a cool dry place. Reseal bag after use. Gluten free wholegrain oats, dates, coconut milk (coconut milk 96.5%, tapioca syrup 3%, cyclodextrin (starch from corn) 0.5%), pumpkin seeds (10%), goji berries (7%), chia seeds. Allergens shown in bold. Kitchen also handles peanuts, nuts, milk & egg. Warning may contain stones/pits from the fruit. I love, love, love this porridge. I love, love, love this porridge. In all flavours. It tastes wonderfully creamy and takes minutes to make. Just add hot water. A fast and easy option for breakfast at work or my suitcase when I’m travelling. This product is dispatched by The Great British Porridge Co. This item has a shipping weight of 800g. Delicious, healthy instant porridge made with 100% natural ingredients - bye bye boring breakfasts!